Four-time CrossFit Games veteran Chyna Cho made her first CrossFit Games appearance in 2010. After, she fought for four years to make it back, narrowly missing Games qualification every year until 2014. At the 2011 Northern California Regional, a tiebreaker dropped her to fourth after tying Annie Sakamoto for third. In 2012, Cho took fourth again at regionals. She finished sixth in 2013. Demonstrating the perseverance she’s celebrated for, she broke the trend in 2014, returning to Carson and qualifying for the Games every year since, with a career best finish of sixth in 2015. 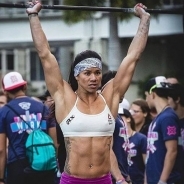 A former collegiate swimmer, she owns Good For You CrossFit in Newark, California.